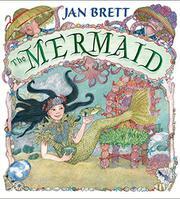 More “The Three Bears” than “The Little Mermaid,” Brett’s latest picture book was inspired by her visits to Okinawa and the New England Aquarium, where she encountered the Pacific octopus. The titular mermaid is named Kiniro, and her Japanese-inspired name, dark rather than golden tresses, and East Asian features are links to Brett’s Japanese inspiration for the story. Various illustrative details of the setting and characters’ costuming also seem tied to Japan, but the text is firmly rooted in the very English “The Three Bears.” While swimming with her friend Puffy (a puffer fish), Kiniro happens upon the house of an octopus family. In keeping with the folk-tale source material, Otosan (the father), Okasan (the mother), and Baby, an octopus family, have all gone out, leaving Kiniro to try their breakfast, their chairs, and their beds. In each instance she prefers Baby’s things, and she drifts off to sleep in a clamshell bed. Throughout, Brett’s signature sidebar illustrations show the octopus family on their outing, each wearing a hat. (A subplot about the octopuses’ hats detracts from the story with superfluous detail.) When they return, they are upset by Kiniro’s intrusion, but Puffy protects her, and they escape with a new friend in tow—a stingray who had been Baby’s hat and which Kiniro replaces with a tiara.